Which is the best IWB holster for M&P shield? When it comes to firearms, it is important to have the right carrying case in place. Holsters have been around since before Western times, and continue to be of prominent use today. The popular military and police semi-automatic pistol (M&P) is a rather small pistol which requires a good quality holster that is neither too large nor too small. Due to its thin design, good craftsmanship is desirable in a Holster, and choosing a holster that fits your lifestyle is essential to carrying comfortably every day. In this article we look at 3 of the best IWB Holsters for M&P Shield, and include some of their pros and cons, as well as a little about each product. Hopefully you will be able to make the best purchase suited to your needs, and of course find the Holster which fits your M&P pistol like a glove. If you are looking for a holster that provides ultimate comfort while at the same time providing complete concealment when carrying, then the Holster by Tulster is a pretty good product to go for. Some customers experience issues with the size of clip included, however a larger one can be ordered separately. The first best IWB holster for M&P shield pistols on our list is the shield holster by Tulster. This is an impressive holster which is of excellent quality and popular with customers thanks to its level of comfort, adjustability and attention to detail. When wearing a Holster, comfort is the key! With this product there is a 0-15 degree cant which can be adjusted to your individual preference, featuring a 1.5” quick clip which easily fits on to any sized belt. The Tulster Holster also features a full sweat shield keeping any sweat away from your firearm. The Holster by Tulster is crafted with the upmost attention to detail. Unlike many holsters, this one comes with a tensioning screw so that you can fit the Holster to your personal preference, and are guaranteed it will fit your pistol properly. The CANT angle is also easily adjustable, and once it is set it will lock in place and click so you know it has been fully holstered. If you desire a universal fit Holster, then this product is a very good option to go with. Favored for its superior comfort and quality craftsmanship, the TacX Pro Gear Holster will provide you with excellent concealment when carrying! Although Universal fit, when it comes to SIG models, a few stiches may need to be cut to fit the trigger guard through. The second best IWB holster on our list is by TacX Pro Gear, and it’s a winner when it comes to comfort. Thanks to its universal design, this is a popular choice on the market as it can fit many different sized pistols. In order to avoid ‘sight rub’, or the rubbing of holsters against skin, this Holster has been designed with comfort in mind. Created with soft padded neoprene, TacX Pro Gear have excelled and created a Holster which feels close to invisible when carrying. The thin, flexible, lightweight and breathable neoprene removes moisture and helps to avoid the buildup of sweat, making it a very easy to wear product. The good thing about this specific Holster is that it can fit any sized pistol –unlike the majority of sub-compact hand guns that most universal holsters restrict you to. 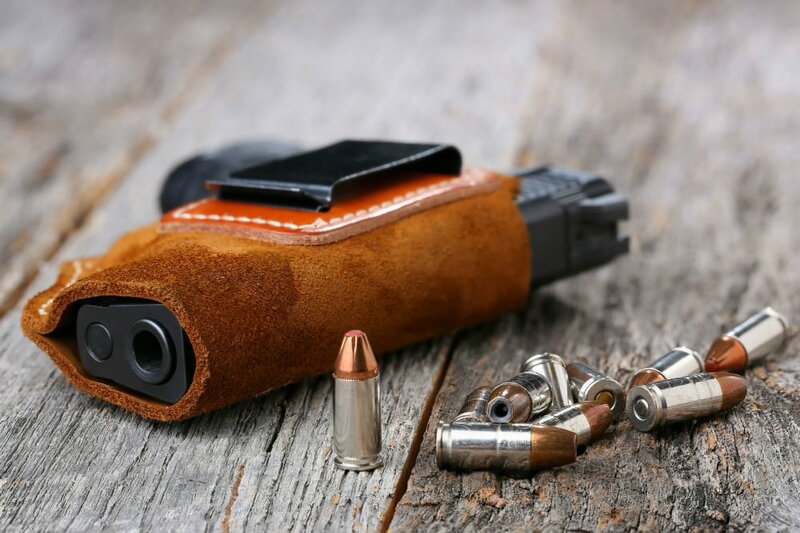 Therefore, you can relax knowing that your gun will fit and that it is ultra-secure, thanks to the holster’s strong metal which won’t bend or snap. With this Holster, TacX Pro Gear throw in a fantastic neoprene belt clip which can be used to carry any extras such as magazines, knives, pepper sprays, tasers, or anything else. This makes for a multi-functional pack guaranteeing you ultimate concealment for pistols and much more! The third and final Holster by FoxX Holsters is a perfect one which molds to your body! The easy to conceal holster is designed with the user in mind, and does not disappoint when it comes to comfort. Clip quality has been an issue for some customers. Usually, finding a waistband holster can be a bit tricky as they can often be uncomfortable to wear. This product from our list of best IWB holster for M&P shield pistols is definitely one which is built with comfort at the forefront. Using premium tanned leather instead of the usual rubber design which is found in many holsters, this holster is very comfortable to wear and actually molds to your body, thanks to the precision molded Kydex fit. One of the most favored features of this holster is the 5 levels of adjustment it comes with, making it even easier to find the perfect ride height as well as cant. This also means it can fit a variety of different sized people without any worries! Featuring black spring steel belt clips coated with oxide, this guarantees a strong and durable holster which can even be tucked making it super concealable. Being such a durable product, it can easily be worn for everyday use. From our list of best IWB holsters, there is one that stands out and which is also a current favorite on the market, and that is the Universal IWB Holster from TacX Pro Gear. This Holster is preferred due to its superior comfort and overall universal design, as it can be used with a larger variety of pistols. This is also the best option for those individuals on a budget, making it a win-win product! The second best rated product on our list is the Tulster Holster, which is also a very popular product on the market right now. This one is favored for its adjustability and its handy sweat shield! So there you have it, 3 of the best IWB holsters for M&P shields on the market! Hopefully this guide will help you to make a better purchase next time you are looking for a good quality holster.